This morning I take my bike in for repair and for a service. 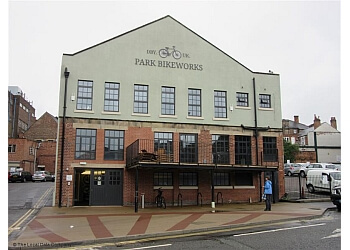 I decide to give Park Bikeworks in Derby yet another go as it’s under yet another different owner. The building itself is now run by Huub, so hopefully some of that professionalism will rub off. This does mean I need to leave earlier in order to still get to work in decent time, so I am out of the house at 6:50am. It all goes rather well, with being earlier the roads were a bit quieter, although it’s very cold. Yet despite the cars being iced over the roads were fine. The general diagnosis isn’t good and they tell me they are keeping the patient in overnight, in fact probably until Wednesday as they need to order some parts. That’s what they said last time when they end up holding it hostage for ten days. So on the bus tonight.